Werewolves tend to get a bad wrap. And we get it. They make the most beautiful moonlit nights unsafe for those couples who just want to innocently walk hand in hand through their small town cemetery. They can ruin a family run farm's last livestock in one night. So yeah, they're not a monster you want hanging around. But werewolves aren't all bad. For one, a high werewolf population will always keep pesky vampires away. Also, as long as you keep your livestock indoors at night and keep courting couples in movie theaters or cars that can easily start up and drive away, werewolves are sure to add plenty of character and gossip in a typical sleepy small town. Think about the macabre tourism industry for once! This beastly costume will be the hit to any Halloween party. It features a black leather jacket style vest with faux fur busting out of your sleeves. The real showstopper is the full head mask with a gnarly face and vicious looking teeth. It has eerie red eyes, beastly ears, and a moveable mouth. There are eye holes right next to the snout so you'll have limited sight when you're prowling around a Halloween party. Are you ready to rage? This scary ensemble is sure to shock other Halloween revelers. All you need to do is pair this costume with a pair of tattered jeans and perfect that eerie howl. Want to pair up for Halloween? Pair this classic monster ensemble with the likes of Frankenstein's Monster, a mummy, or even a mummy or two. Is there any better way to create and living creature feature? That's one show we'd want front row tickets for. 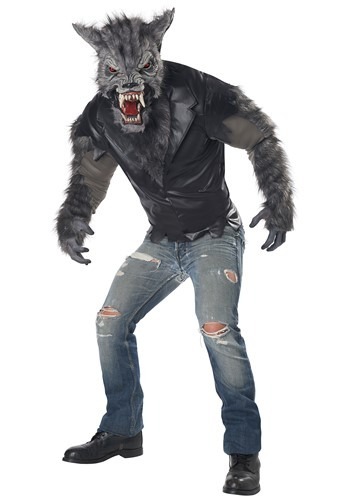 Whether you're a pack leader or a lone wolf, you're sure to rock this rough look!